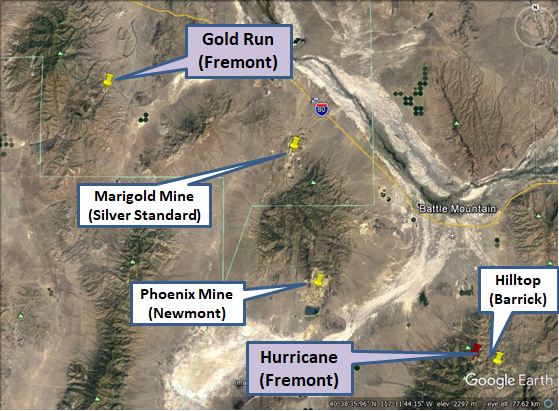 Fremont Gold (TSX-V: FRE) is dedicated to gold discovery in northcentral Nevada. The company owns two gold prospects, the Hurricane and Goldrun plays and is in advanced negotiations for two additional properties in the same region. Our mission is to identify compelling targets in known districts and to delineate low-cost opportunities that are ready to drill. Fremont aspires to prove out resources through drilling programs and upon delineation of a significant resource to pursue an exit via a sale or development merger. Fremont Gold Ltd. was founded in 2017 through a reverse takeover (RTO) of Palisades Ventures Inc. The two private acquiring partners are the companies 1027344 B.C. Ltd. and Intermont Exploration, LLC. These entities hold the rights to the Hurricane and Goldrun gold prospects. 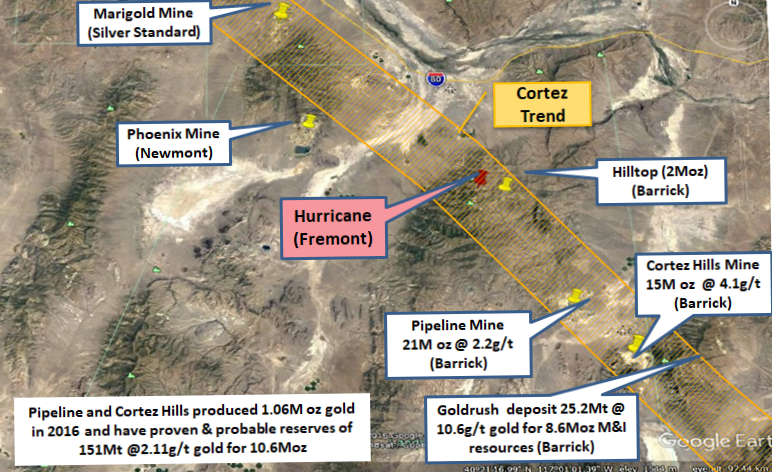 Hurricane and Goldrun are mid-stage projects with previous drilling but no resources. The properties are located along the prolific Battle Mountain – Eureka trend, which includes a number of world-class gold deposits, including Cortez Hills and Pipeline. Fremont is led by the former Vice President of Business Development of Magellan Minerals, Dennis Moore as President and Chief Executive Officer. Clay Newton, formerly of Kennecott assumes the responsibility of Vice President of Exploration. Paul Hansed, formerly of K PMG and Magellan Minerals, shall serve part time as Chief Financial Officer, and Alan Carter, formerly with Rio Tinto, BHP Billiton and CEO of Magellan Minerals, shall serve as Chairman of the Board and advisor. In conjunction with the RTO transaction, Fremont has raised $1.55M to capitalize drilling at Hurricane and near-term key acquisitions. Mining friendly jurisdiction, with great infrastructure, few environmental impediments and reasonable taxes….USA! 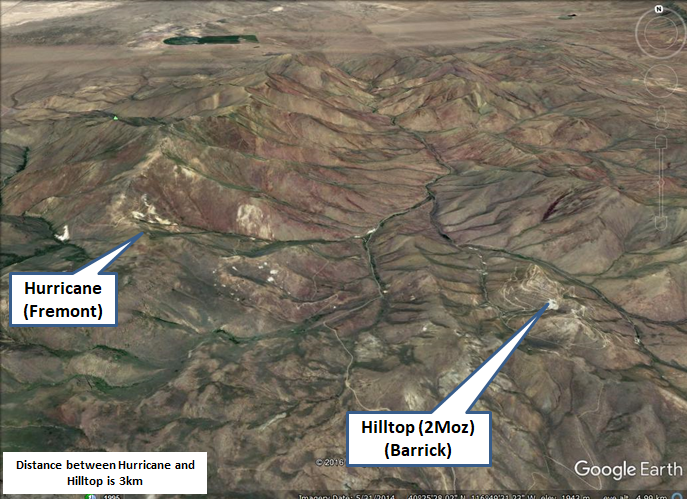 The Hurricane prospect is located in the middle of the Battle Mountain-Eureka trend on land owned by the Bureau of Land Management and well-served by county road access. As the map below shows it is in close proximity to a number of historical gold and silver producers, including the Marigold, Hilltop, Phoenix, Cortez Hills, Pipeline Mines. Fremont has acquired six claims at annual fees of $5000 expected to rise in coming years to $25,000 per annum. Mineralization occurs in the upper plate of the allochthon. 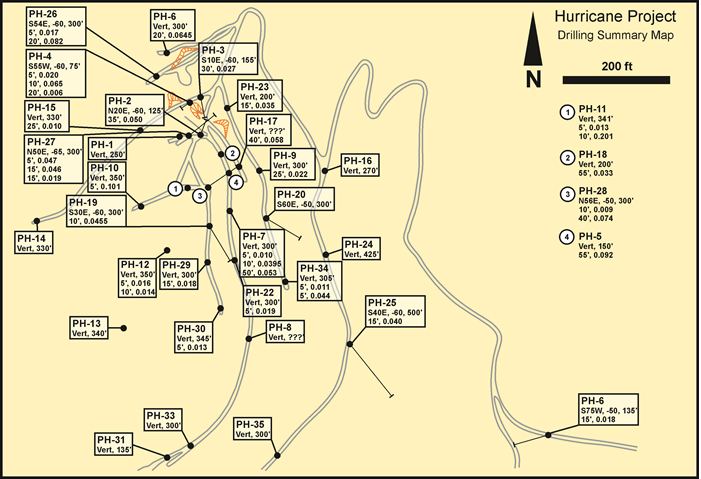 Exploration to date consists of 25 relatively short holes drilled by Pegasus in 1991, locations given in the map below. 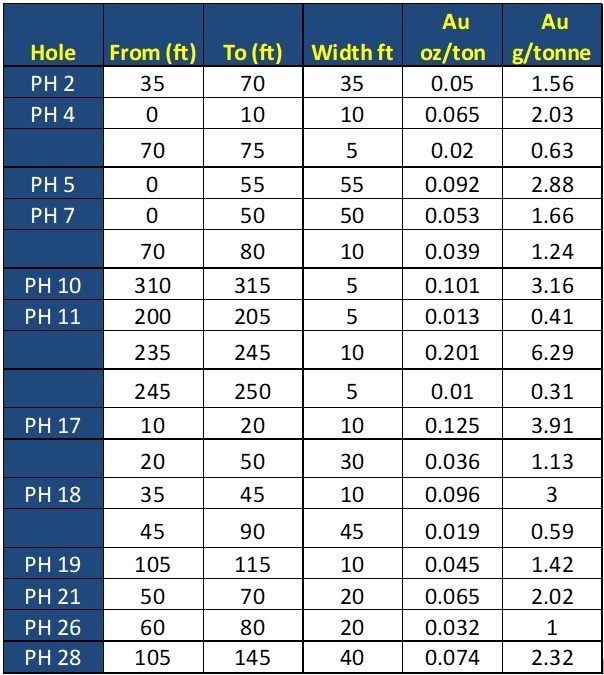 Results are summarized in the table below and include 35 ft @ 1.56 g/t, 50 ft @ 1.66 g/t, 55 ft @ 2.88 g/t and 40 ft @ 2.32 g/t gold. Areal view of the confluence of the two forks of Rock Creek and the locations of the Hurricane Prospect and the Hilltop Mine. The Goldrun prospect is located at the intersection between two famed gold-bearing provinces, NW-SE-sriking Battle Mountain-Eureka and the SW-NE striking Getchell Trends. Specifically it is located immediately subjacent to the historically significant Adelaide District. The prospect occurs on BLM land about fifty miles northwest of the Hurricane Prospect and is well-served by county road access. As the local property map below shows, Goldrun is largely controlled by Newmont Mining. A geochemical/magnetic anomaly southeast of the Newmont claims possibly correlates with an undiscovered orebody, which Fremont expects to flesh out with a targeted drilling program. Property Overview: Ely Gold’s Gold Bar project was acquired in September, 2015, by staking open BLM ground imme- diately west and north of the past-producing Atlas Precious Metals Gold Bar mine and mill complex located 30 miles (48 kms) northwest of Eureka, in the southern Roberts Mountains. 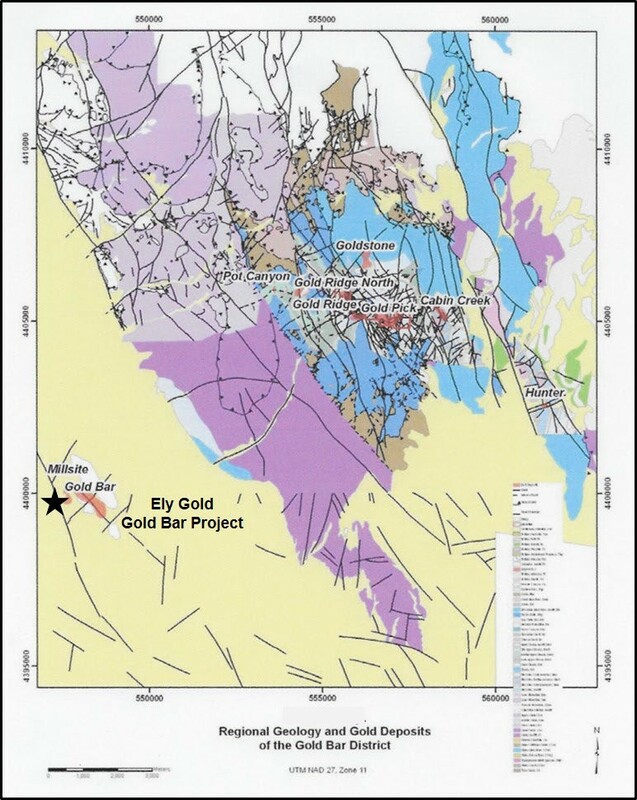 Ely Gold’s Gold Canyon project is located approximate- ly 6 miles (9.5 kms) northeast of Gold Bar. The Gold Bar district is a prolific,active mining jurisdiction in the southern Battle Mountain-Eureka (Cortez Trend) Mineral Belt that contains several Carlin-type disseminated gold deposits. 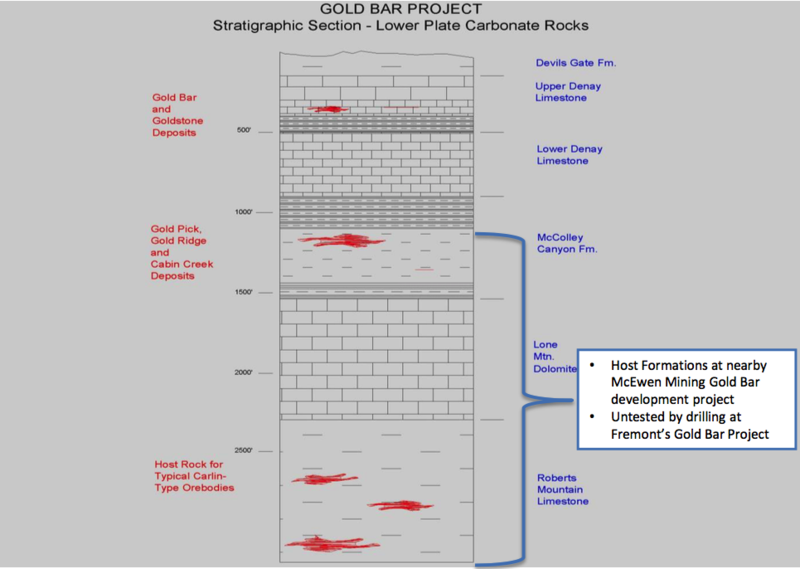 Stra- tegically located along the western flank of the Roberts Mountains, Ely Gold’s Gold Bar project consists of 21 unpatented lode claims (~434 acres) plus 6 patented mill site claims (~30 acres) and 6 patented lode claims (~124 acres),all with no underlying royalties.The Gold Bar project comprises the drill-indicat- ed gold mineralization of the undeveloped Mill Site gold deposit; 1.62 Mt @0.091 oz/t (2.57 g/t Au) totaling 147,700 ounces gold and a larger encompassing envelope of gold mineralization known as the Gold Bar Pit-Tailings Dam resource; 2.6 Mt @ 0.065 oz/t gold (1.84 g/t Au) totaling 170,514 ounces gold. TheMill Site and Gold Bar Pit-Tailings Dam resources are historical and are not compliant withNI 43-101. They were estimated for the Atlas Corporation/Granges Exploration Ltd. joint venture in 1996 in a company report titled Gold Bar Review. Additional drilling is required to verifythe historical estimate. 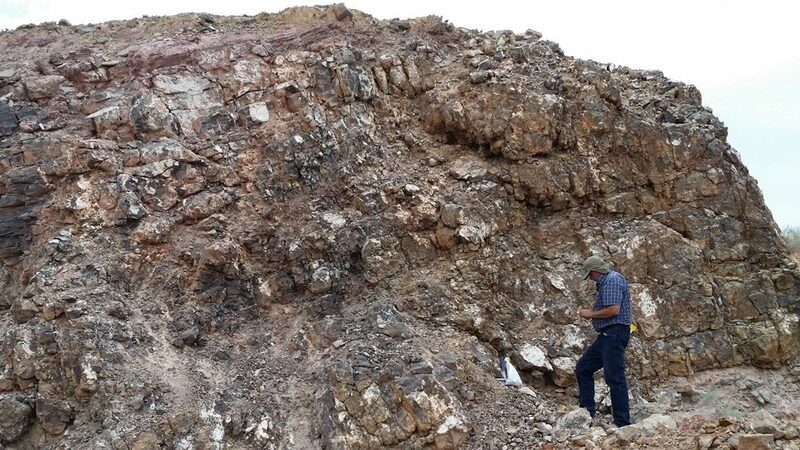 A qualified person has not done sufficient work to classify the historical estimate as current mineral resources or mineral reserves and Ely Gold & Minerals Inc. is not treating the historical estimate as current mineral resources or mineral reserves. The Atlas Gold Bar deposit occurs within a north- west-trending horst of lower plate limestone partly covered by post-mineral rhyolite ash-flow tuff and alluvium. Thin- to medium-bedded lime mudstone of the Upper Denay Formation was the principle host rock. The stratabound, northwest-elongate Gold Bar orebody was 910 m long, 60-210 m wide, 15-25 m thick and dipped gently (~25 ͦ ) to the east-south- east. Exploration History: In 1996 the Atlas-Grange Joint Venture calculated a geologic resource of in-situ gold mineralization in the immediate vicinity of the Gold Bar pit and tailings dam area. The Gold Bar pit-Tail- ings Dam resource was calculated at a 0.025 oz/t gold (0.71 g/t Au) cutoff and totaled 2,608,000 short tons grading 0.065 oz/t gold (1.84 g/t Au); Ely Gold’s claims now cover this mineralization. Much of the historic drilling stopped at shallow depths (<150 m) and failed to test some favorable host rocks for gold mineralization in other parts of the district (e.g. McColley Canyon Fm. ), lying stratigraphically below the Denay Limestone. The Mill Site deposit was discovered by Atlas in July, 1995. 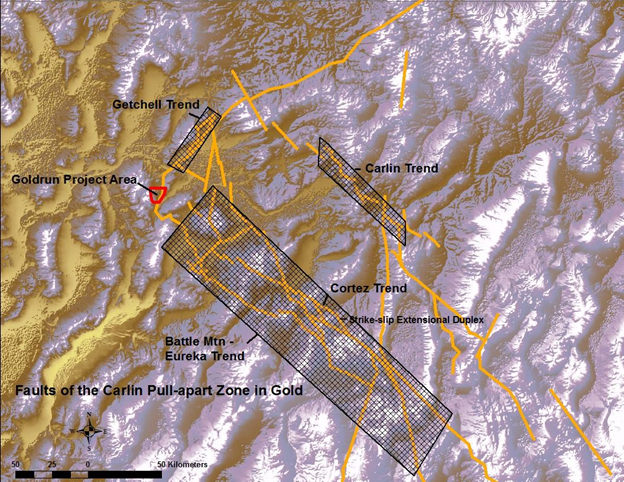 The deposit is a 305 x 610 meter northeast-trending zone, ranging from 30 to 45 meters thick, located about 300 meters west of the northwest end of the Gold Bar pit. 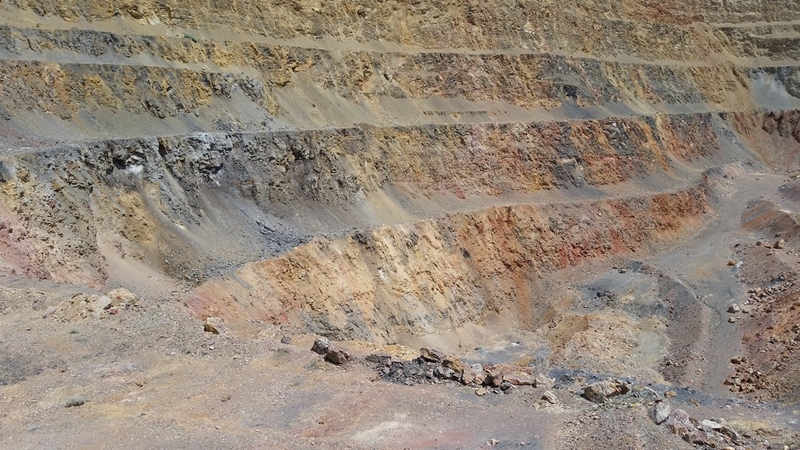 The geologic resource for Mill Creek totaled 1,626,000 short tons grading 0.091 oz/t gold (2.57 g/t Au). 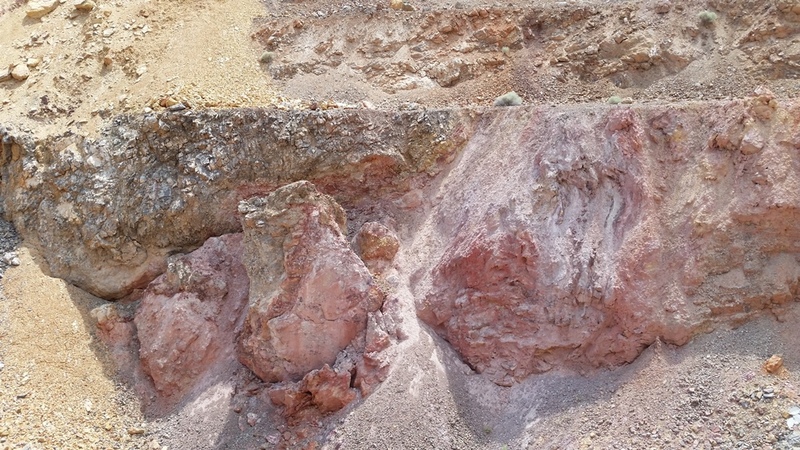 Unit 2 of the Upper Denay Formation is the main host rock and the mineralization is buried by 120 to 180 meters of gravel and Tertiary volcanic rocks. 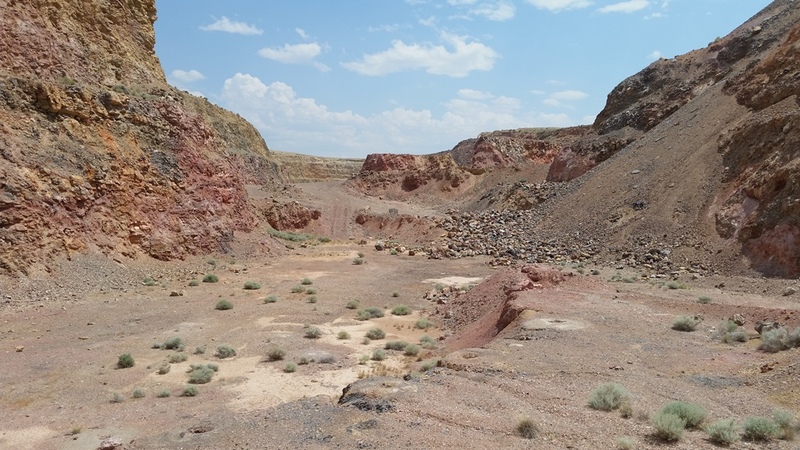 The Mill Site deposit may be part of Gold Bar that was down-dropped by a post-mineral northwest fault paralleling the west side of the pit, or was down-dropped by a northeast striking fault on the end of the pit. Outlook: The Gold Bar project has strong potential for discovery of additional gold mineralization as step-outs from historical drilling and unidentified concealed bodies of mineralization in areas only tested by shallow or wide-spaced drilling. Several concealed northeast and northwest striking faults identified by CSAMT geophysical surveys bisect Ely Gold claims and could be additional mineralized feeder structures that have not been tested by drilling. Status: The Gold Bar property is currently for sale or option. The Ely Gold business model offers 100% ownership terms with retained royalties not to exceed 3% net smelter returns. For full data room access, including assay results, historical reports and photos contact Jerry Baughman or Trey Wasser. Discovered TZ Tocantinzinho (2M oz) and Cuiú Cuiú (1.3M oz) gold deposits. – Identified several gold deposits in Bolivia that were acquired by DaCapo Resources. 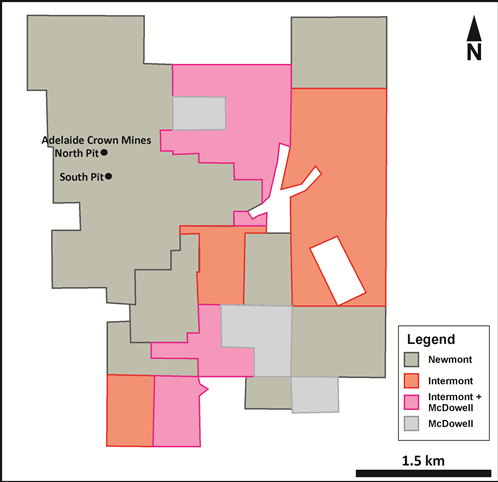 – Vended TZ to Brazauro Resources, which was later acquired by Eldorado Gold Corp. Dennis and partner Alan Carter, retain a 3.5% royalty on the 2Moz deposit. – Founder with Alan Carter of Magellan Minerals ̶ IPO in Feb 2008. ― Cuiú Cuiú and Coringa were the main assets. – Magellan was acquired by Anfield Gold in May of 2016. – Since 2012 has worked with Dr. Clay Newton in Nevada, identifying and acquiring prospective gold properties. CEO of Cabral Gold, director Anfield Gold, Peregrine Diamonds and Altamira Gold. PhD Geologist with extensive corporate experience in Canada. Ex-Rio Tinto and BHP Billiton; Co-founder of Peregrine Metals and Peregrine Diamonds. Former CEO of Magellan Minerals. 30+ years in the industry. President & CEO of Vendetta Mining Corp., Previously founder of Underworld Resources acquired by Kinross Gold Corp in 2010 for $140M. Ex Kennecott PhD geologist. Spent bulk of his +30yr career targeting gold and copper in Nevada. Involved in Midway discovery. -Management is forgoing salaries until the next financing.